Chennai-based Nuha started The Nuha Wardrobe that specialises in kurtas and dress that are sourced from Mumbai, Delhi and Surat. The iconic dialogue from The Mask, " Somebody stop me", makes so much sense when you are going kurta shopping. How many kurtas are too many kurtas, anyway? Pandering to that, Chennai-based Nuha started her own wholesale and retail online store that has kurtas and dresses on offer. They also have suits, Pakistani suits, dress sets and palazzo sets, dresses and kurtas. They specialise in cotton, georgette, silk, satin, and crepe and most of their kurtas are sourced from Surat, Mumbai, and Delhi. We liked their black kurta with golden block prints, especially if you want to wow at a dinner party. No two kurtas are the same and the different styles are what makes them unique. 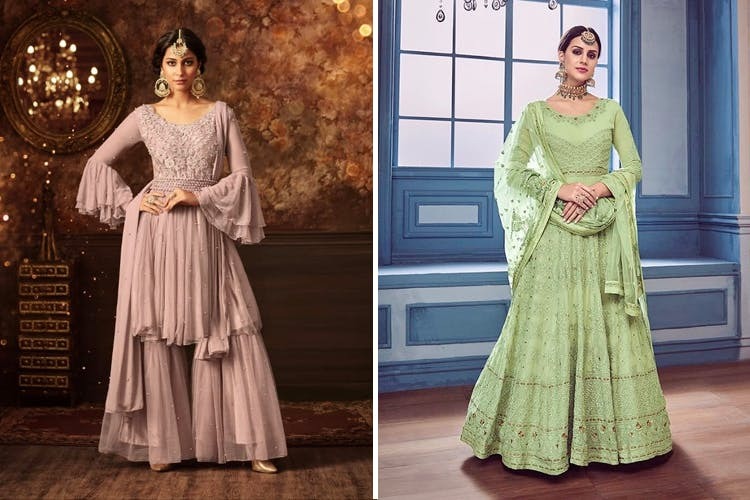 Double layer angarakha0style anarkalis, long kurtis with front cut, kurtis with bell sleeves, asymmetrical kurta with mirror work, kurti with attached jackets are some of their specialties. Their green kurta with gotta detailing and mulmul jacket is a big hit and one of their most popular pieces. And the best part is you won't ever run into someone wearing the same outfit! They also have a special and limited collection of shoes.